Editing data in GridView is one of the common scenario now a days. With 2 way data binding feature of AngularJs, it became extremely easy to write code for relatively, so called, complex operations like batch editing in GridView. This article provides you multiple approaches on how you can implement batch editing in GridView with just few lines of code. I have also given the sample to post the updated grid data to server using WebAPI in order to save it to database. Please note that if you are looking for a built in AngularJs GridView tool, you will get many tools with a lot of features. This article provides a native approach with just few lines of code and will help you to fulfill your custom needs. The same approach can be applied to any kind of inline editing too. 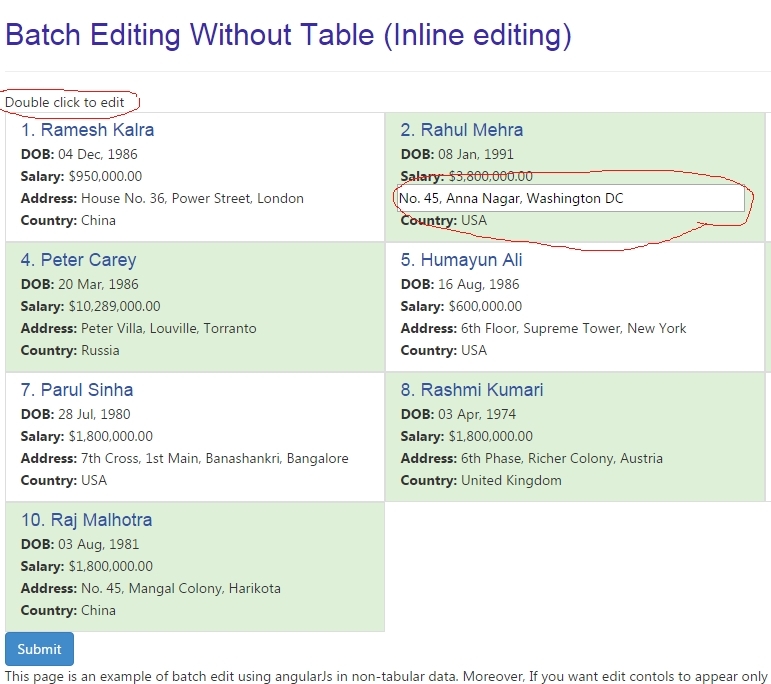 Example has also been provided for inline editing in non-tabular repeat items. This article assumes that you know the basics of AngularJs. Batch editing in AngularJs can be implemented by using 3 simple steps. To fetch data from the server is easy. You can simply use $http/resource and assign the retrieved data to your scope variable. 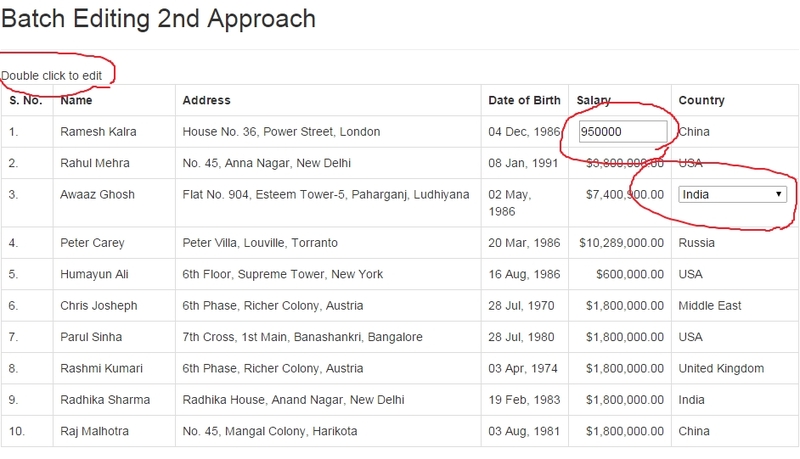 If you know about AngularJs and Html, creating table/grid is quite easy. Just create the table element and use ng-repeat to populate all respective element of each row. If you don’t want to use table, you can very well choose any other template. See the below sample, where model/data is directly bound to html control. The beauty with AngularJs is, it updates the model automatically as soon as you change the data in your html control. <select ng-options="c.Name for c in countries" ng-model="employee.Country"
You can toggle this display based on any event. In the sample, It is being toggled in double click event. When the data is changed in the html controls, the model updated automatically. So, in this step you don’t need to worry about collecting data from the controls. Just, send the model back to the server via and API. In my example, I have used $http to post the updated model back to the WebAPI. <input type="text" ng-show="employee.edit.Name" ng-blur="employee.edit.Name = !employee.edit.Name"
<input type="text" ng-show="employee.edit.BirthDate" ng-blur="employee.edit.BirthDate = !employee.edit.BirthDate"
<input type="number" ng-show="employee.edit.Salary" ng-blur="employee.edit.Salary = !employee.edit.Salary"
<input type="text" ng-show="employee.edit.Address" ng-blur="employee.edit.Address = !employee.edit.Address"
<select ng-options="c.Name for c in countries" ng-show="employee.edit.Country" ng-blur="employee.edit.Country = !employee.edit.Country"
In this section, I have explained a bit about the way code is written. It will be helpful for those who are new to AngularJs. The best advantage of using native approach to create a grid is, you can customize it to any extent you want. In our example, we have a textbox, drop down and other controls inside table cell. For appearance, border is removed and width is set to 100%. For all edit page, single controller called employeeEditCtrl has been used with multiple views associated with it. This controller contains only three main functions. One to populate Employee and related data from the WebAPI. Another to set the drop-down list values based on retrieved data. And the third one is to submit the data on submit button click. For details, please have a look at the employeeEditCtrl.js file. I have used factory to retrieve the data using $http but you can retrieve data by any way you want. angular-ui-router.js is used for routing and navigation. I havn't used any database for simplicity. Mock DB has been used to provide the data to UI. This article also acts as a sample for displaying data in grid using angular js. 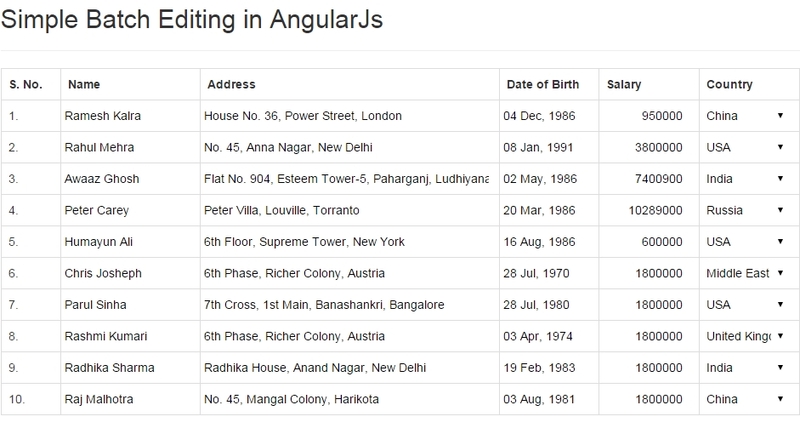 Moreover, the code also provides the sample on how to use angular ui routing and use date-picker control in AngularJs. Due to lack of time, I have not provided the sample on inline editing for row-only. At later point of time, I will also add sample on editing records as a pop-up. Moreover, in current sample, I have added only most commonly used editing controls like textbox, number, datetime and dropdown. In future, I will add some complex controls also. 15 Oct, 2014: First version. suppose grid will have edit and delete button like old days asp.net webform gridview. when user click on edit button then whose row will be in editable mode instead of single column. how to achieve this kind of things with angular. if possible please develop such one and come with a article. Dziewczyny wygladaja najlepiej w ponczochach i bieliznie. rejstopy, to jest to !! 5 Stars already! Good one! Thanks for Sharing! Very nicely done. Alternatives are always welcome and dependency on canned tools often limit your creativity and abilities. 1. Two downloads of the same thing but with different names... why? 2. An MVC project looks like super over kill for something this simple. Tons of files when only a few are needed! Thanks Dewey for the feedback. 1. Codeproject by default make a copy of uploaded .zip file by removing exe. I will remove the one. 2. Here also, I took MVC default project template to start. Will clean up the project in my next update. Yes, there are definitely many UI tools available including the one which you have mentioned. The idea here is to understand basics and native approach. With native approach, you can customize your control as per any type of need. You get, so called, complete control over the HTML. Many times when RAD is the preference and the requirement is generic, we use existing tools. For custom needs, you might be looking over such kind of approach.